When you see our amazing print quality, we know you'll be amazed, so we're happy to send your favorites (plus lots of other goodies!) to you with our compliments. Samples are not personalized, and sent exactly as shown on our web site. Your actual order will include all of your customization. 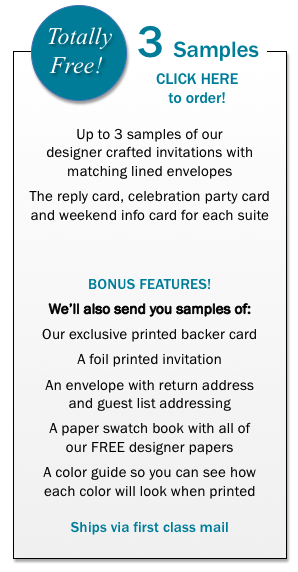 You may notice how most invitation sellers charge for printed samples. Since we're the designer and printer, we can do things that others can't! Order up to 6 samples and we'll send a $20 coupon! With have so many great designs, you may want more than 3 samples. With your $10 payment to cover the extra samples, we'll upgrade your shipping to 2 day Priority Mail and include a coupon for $20! That's better than free! It's easy to order your free samples! Simply decide how many samples you'd like and click the box for either offer. Then, choose your samples from the drop down menu. 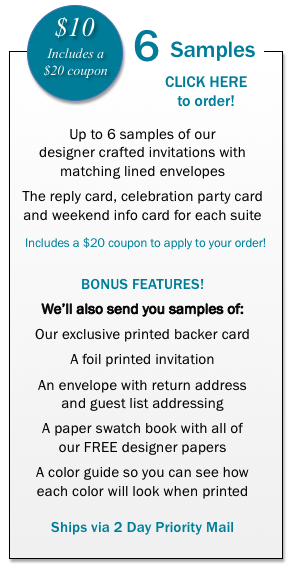 If you'd like samples from both our Bar and Bat Mitzvah collections, select B'Nai Mitzvah. Most order ship within 2 business days after the day you place your order. Please allow 3-5 additional days for mailing.